Beautiful cottage in the heart of walkable Riverside, Jacksonville's historic urban neighborhood. The space is stunning inside and out, offering all the convenience of home. Walk a few blocks to eclectic "5 Points," where locals go for a dining/shopping experience like no other, or to the bar district at the intersection of King and Park streets. 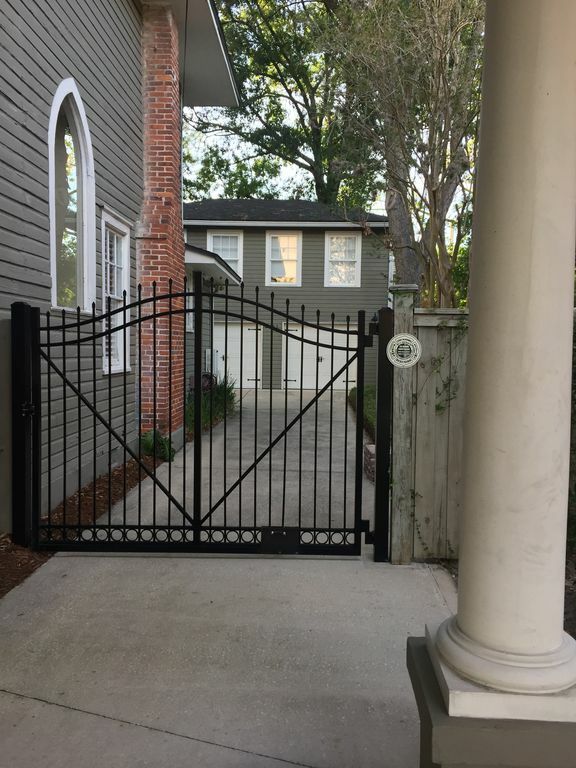 A block off the St. Johns River, and easy walking distance to a local movie house, quality parks, Publix grocery store, St. Vincent's Hospital, etc... A 5 minute drive to downtown Jax. The place offers the best of both worlds, with modern conveniences and quaint historic details. I might not live there anymore, but no way was I going to let this place go. It is too awesome for that. Whether it is the central location, the historic walkable neighborhood, or the modern conveniences that attract you, I hope and expect you'll love it just as much. This home was part of the original Riverside neighborhood that sprung up along the St. Johns River in the early 1900s. This house was built in 1922, and was lovingly restored in 2007. Riverside is well known for its diverse mix of architecture and urban parks. Most of its streets are shaded by centuries-old oaks, and its sidewalks are the same hexagon pavers as 100 years ago. The neighborhood is known for the sort of charm and elegance that must evolve over time, yet is also Jacksonville's most diverse. This is the best of both worlds, blending historic charm with modern amenities. This is private upstairs space, an oasis in a stand-alone building in a gated courtyard; yet steps away are the bustling streets of a neighborhood where you can find pretty much whatever you might want. High ceilings and soaring windows make you feel like you are in a tree house; now close the blinds, and you are in a cozy private retreat. Elegant old-world touches like historically accurate mini-hexagon tiles in the bathroom and the craftsman white kitchen cabinets blend seamlessly with black granite countertops, stainless steel appliances and a 50-inch flat screen "smart" TV. Bathroom offers a full shower/tub. Historically-accurate details such as tall baseboards and mini-hexagon white floor tiles blend gracefully with gleaming modern sink and plumbing fixtures. Oversized linen closet. New appliances are stainless steel, and are full sized. Craftsman white cabinets everywhere. Black granite countertops. The perfect place for us! Location was fantastic! My wife is a runner and I bike along. The surrounding neighborhood is beautiful and safe. We headed west on Riverside Ave. and passed some amazing properties. Walkable to King St. district and Avondale neighborhood, both with great shopping and eateries. Walgreens and Publix also walkable for quick necessities. Nearby parks and the riverfront provided scenic views. The coach house is neat and cozy. Our host was responsive and accomodative, responding quickly to our questions. Pleasantly surprised by how much we enjoyed JAX--we will be back! Great spot in five points! Would stay here again!!! Exactly as described— great space! Enjoyed our stay! Great location and a lot of space in the house. Beautiful home in safe area. We enjoyed our stay at this beautiful apartment. It's in a very safe neighborhood & that meant alot. Apartment was clean & stylish. The homeowners were very welcoming thei the booking process & answered every question we had immediately. Thank you so much!! Would definitely reccomend. Very nicely furnished studio apt convenient to Five points, Avondale and downtown—which is exactly what I wanted. Thanks. I stayed here for 3 weeks and had a very wonderful time. The location cannot be beat as it is across the street from the scenic river and four blocks away from the grocery store and other bars/restaurants. The kitchen is excellent and had everything I needed when preparing a meal. The "cottage" has seven beautiful windows that let in a lot of daylight during the day making it feel warm and cozy. The bathroom came equipped with towels, wash clothes, hair dryers, soap and shampoo and even an iron - once again, everything I needed. The unit was very clean and had ample trash bags and paper towels for my use with more in the garage if I needed more. However, I feel like this unit is best equipped for a short term stay rather than a long, 3 week one like mine. There is not a washer or dryer; however, there is a laundromat one block away. The unit is decent size for a studio; however, since I had a large suitcase with a lot of clothing, I didn't really have anywhere to put all of my belongings other than the floor - a problem I don't imagine having for short term guests. There isn't a kitchen table either, but there is a rectangular folding table which is ho hum. The last con to this unit is the walls are pretty thin - to the point where I can hear what neighbors are saying rather clearly if they're outside talking. Nevertheless, I would seek this unit out again should I ever find my way back to Jax. The cons were minimal and very manageable if you know what they are heading into it. I would give this unit 4 stars for long term stay and 4.5 stars for the short term, with the noise level being the strongest negative.